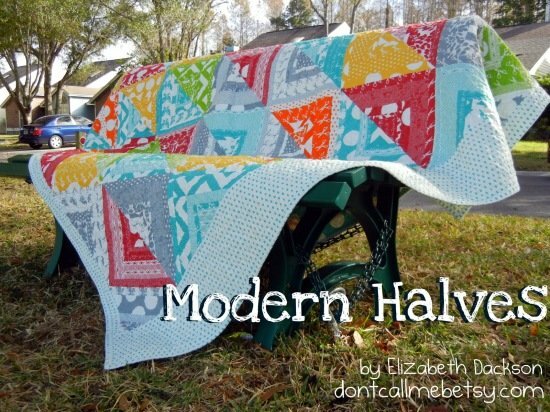 This fun quilt is made with fat quarters. The quilt will have 32 blocks total. Elizabeth recommends stacking fat quarters when cutting to save time. Try it out and see if it works for you! 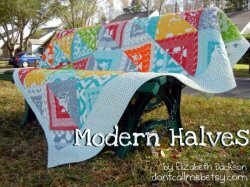 This tutorial is full of great photos so you can know exactly what to do to make the perfect modern halves quilt. "Hello again, everyone! My name is Elizabeth Dackson from Don’t Call Me Betsy and I am so excited to share another Moda Bake Shop recipe with you all today! When I first saw photos of Half Moon Modern, I positively fell in love. I adore the bright, fun color palette of this collection and the fabulous prints, so I was super excited to get a chance to work with it."